I can't hear sound in LeapFrog Academy using Safari 12. 7. Quit your Safari browser and restart it again. You may need to log in again to LeapFrog Academy. Can I play LeapFrog Academy™ without an Internet connection? Can I reset my child's Learning Adventure in LeapFrog Academy™? Can I see and manage what my child is working on in LeapFrog Academy™? Can I view my completed certificate in LeapFrog Academy™ again? Where will I see it? Can LeapFrog Academy™ be played on an Android phone or tablet? How can I change my pet in LeapFrog Academy™? 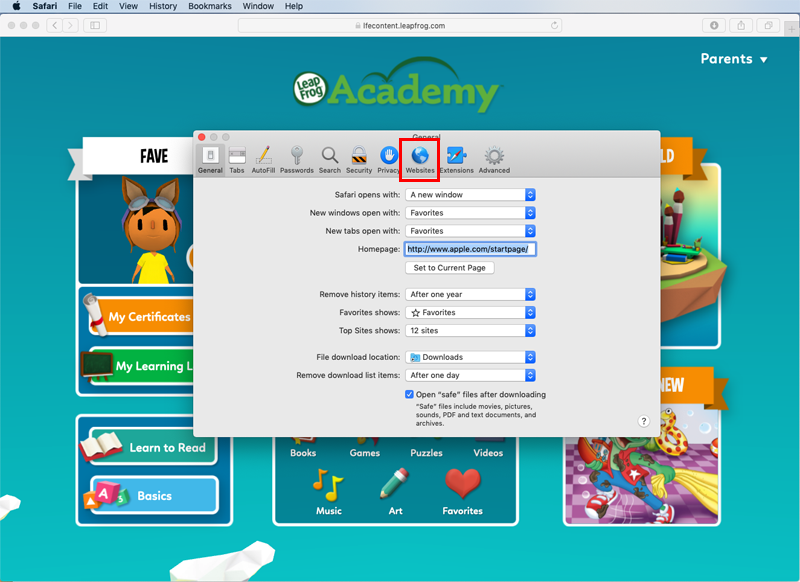 How can I print “Printable” activities in LeapFrog Academy™? How come I cannot go to another island in Learning Adventure in LeapFrog Academy™? How does the LeapFrog Academy™ free trial work? How do I cancel my LeapFrog Academy™ membership? How do I change my character's appearance in LeapFrog Academy™? 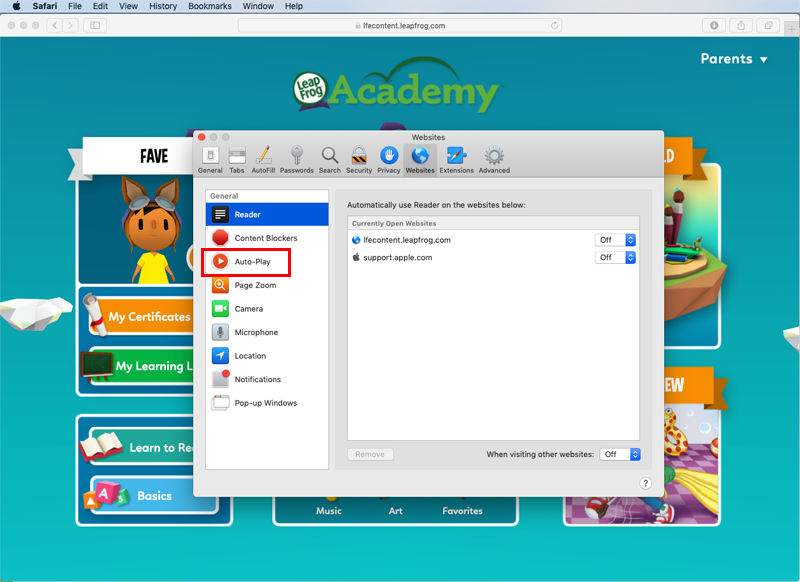 How do I change my email address or password for LeapFrog Academy™? How do I earn marbles in LeapFrog Academy™? How do I edit or delete a child profile in LeapFrog Academy™? 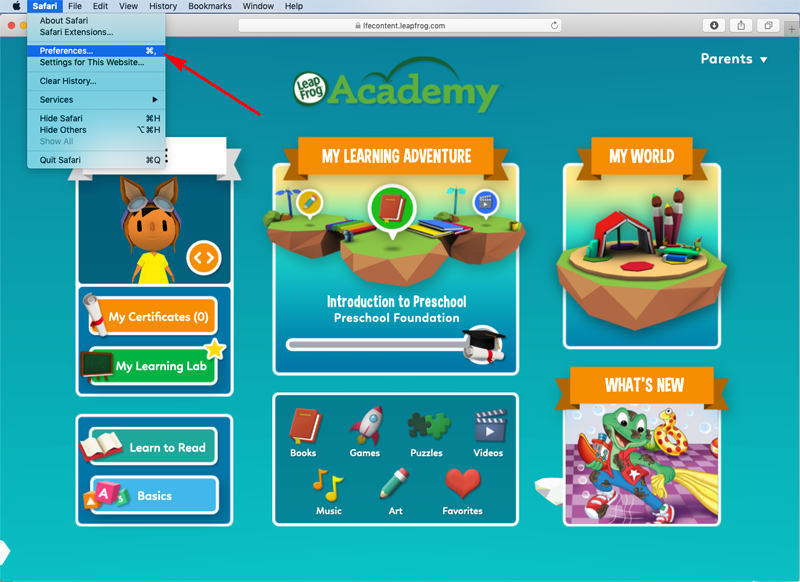 How do I enter full screen mode in LeapFrog Academy™? How do I find content for my age in LeapFrog Academy™? How do I find my favorite games, puzzles, etc in LeapFrog Academy™? How do I go to My World in LeapFrog Academy™? 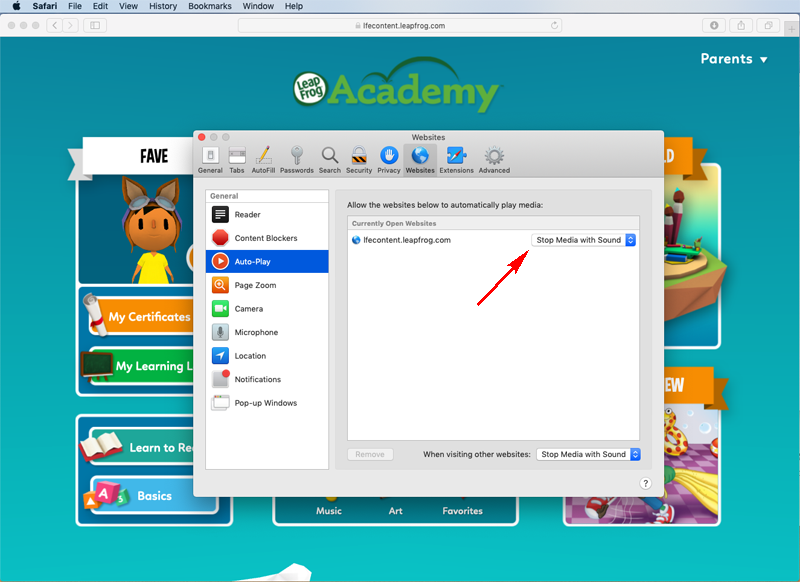 How do I go to the home menu in LeapFrog Academy™? How do I move my character in LeapFrog Academy™? How do I play an activity from the Learning Adventure in LeapFrog Academy™? How do I prevent my child from clicking out of LeapFrog Academy™ and going to other sites? How do I set up a profile for another child in LeapFrog Academy™? How do I sign up for LeapFrog Academy™? How do I start playing LeapFrog Academy™? How do I switch from a 6- or 12-month LeapFrog Academy plan to a monthly plan? How do I switch to another profile in LeapFrog Academy™? How do I update my payment information for LeapFrog Academy™? How do I upgrade my LeapFrog Academy account? How many children can play on a single LeapFrog Academy™ account? How often will I be billed for my LeapFrog Academy subscription? If I rejoin LeapFrog Academy™ after canceling my subscription, will my child's progress still be there? In which countries is LeapFrog Academy™ available? I would like to completely reset ALL of my child's progress in LeapFrog Academy™. Is this possible? LeapFrog Academy doesn’t play if I enable Restricted Websites on my iPhone or iPad. 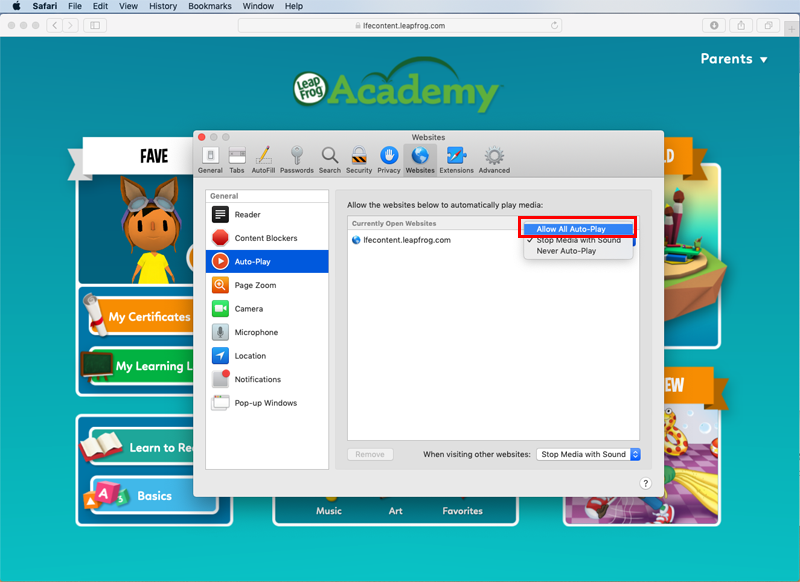 LeapFrog Academy™ is not working with Firefox 43. Music in LeapFrog Academy™ is not working on my MAC running Safari 8. My child's Learning Adventure in LeapFrog Academy™ isn't the right difficulty level. How can I change it? My Learning Adventure progress meter in LeapFrog Academy™ is gone, what happened to it? On my iPad, I don’t hear sound on some games, videos or ebooks. On what devices can I access LeapFrog Academy™? The meter in LeapFrog Academy™ is always full but I stopped getting presents/rewards. What are the marbles for in LeapFrog Academy™? What can I expect to find in the Art category of LeapFrog Academy™? What can I expect to find in the Books category of LeapFrog Academy™? What can I expect to find in the Games category of LeapFrog Academy™? What can I expect to find in the Music category of LeapFrog Academy™? What can I expect to find in the Puzzle category of LeapFrog Academy™? What can I expect to find in the Video category of LeapFrog Academy™? What happens if I cancel my LeapFrog Academy subscription partway through my billing period? What is a certificate in LeapFrog Academy™? What is a collection in LeapFrog Academy™? What is a Learning Adventure in LeapFrog Academy™? What is the clothing item in LeapFrog Academy™ for? What is the Learning Adventure meter in LeapFrog Academy™? Or how do I see my child's progress in the Learning Adventure? What is the Parent Dashboard in LeapFrog Academy™ and how do I use it? What is the pet for in LeapFrog Academy™? What is the recommended Internet speed to use LeapFrog Academy™? What payment methods do you accept for LeapFrog Academy? What presents do I earn in LeapFrog Academy™? When I play LeapFrog Academy with no Internet connection, I don't see all my child's favorite games or books. When will my collection be completed in LeapFrog Academy™? Where did the clothing item I just earned in LeapFrog Academy™ go? Where did the collection piece I just earned in LeapFrog Academy™ go? Where did the pet I just earned in LeapFrog Academy™ go? Where will I find books, videos, games, and more in LeapFrog Academy™? Why am I seeing a message that my LeapFrog Academy™ subscription has expired? Why do I need a payment method to start a free trial of LeapFrog Academy™?